Employers don’t want to think about it. Employees don’t want to talk about it. But this invisible hand is directly affecting how productive your team is. And for business owners, that’s directly affecting your bottom line. That invisible hand is mental health. An employee who is battling chronic mental health issues such as depression or situational issues such as work stress is going to be distracted. With the help of a new wave of technology-enabled healthcare companies, employers are starting to understand just how important it is that workers get access to care for both their teeth and minds. Third-party healthcare technology companies give employees a private forum to talk about their mental health concerns. Those third-party companies are alerting businesses to the prevalence of mental health issues in their workforce, in some cases for the first time. Cheryl Swirnow, the CEO and co-founder of New York City-based Sherpaa, a nationwide online physician practice for large employers, says that her company has been fielding an increasing number of questions about mental health. Cat Clifford, Andy Sekel, Terrence Cummings, Cheryl Swirnow and Jordan Goldberg (L to R). In addition to providing mental health coverage for employees because it makes them more productive, it’s also a way to keep top talent happy. “At the end of the day, it’s a retention tool. These benefits become important because if they are not offering them, and competitors are, they might lose out on some key talent,” says Jordan Goldberg, the CEO and co-founder of stickK, a New York City-based startup that gets people to publicly sign a ‘Commitment Contract’ with financial incentives to incentivize them to change their behaviors. 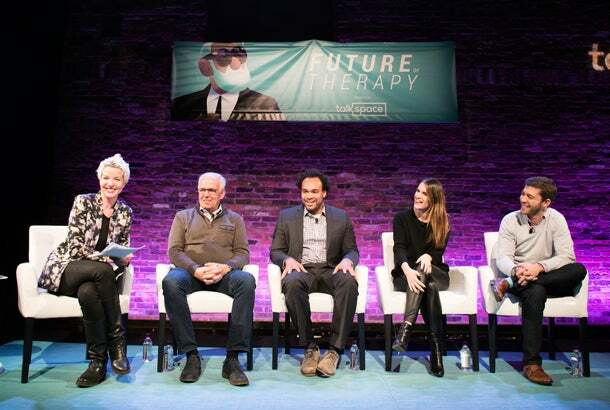 The three founders were speaking at a recent panel on the future of work benefits at the Talkspace Future of Therapy Conference in New York City. (I moderated the panel.) Talkspace is a New York City-based startup that provides therapy services via text and chat. Watch this video to hear more about the evolution of workplace benefits. A wee note, this is a longer video (36 minutes!) than most of the videos we post, so get comfy.